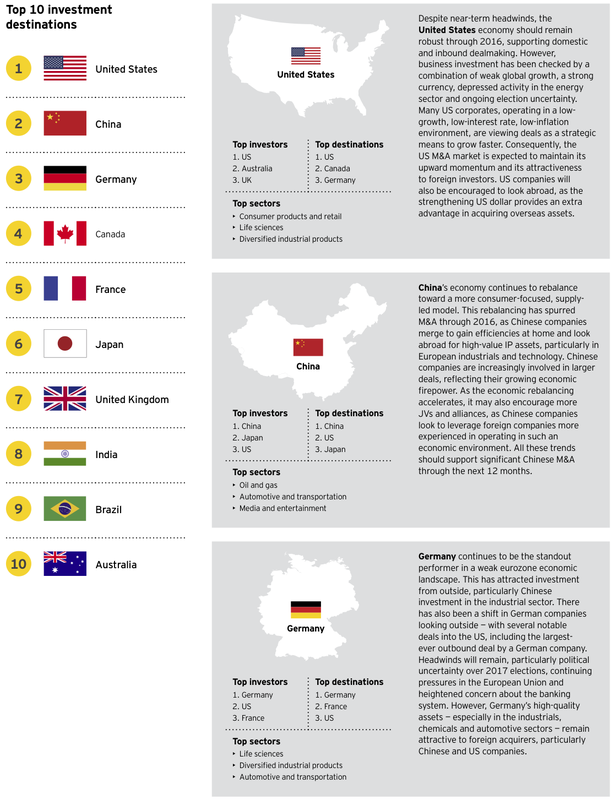 Global Capital Confidence Barometer – Does Seizing Competitive Advantage Mean Deals Take Center Stage? The need to respond to challenges while navigating a complex and fast-changing environment makes dealmaking an imperative, not an option. Executives are looking at more targets, and deals will tend to be smaller. However, as boards look to make innovative acquisitions, they are using analytics to make better decisions. Most executives see the global economy as stable and say corporate earnings are back on track. But there are uncertainties ahead, both in the near and long term, including political stability in their home markets and tightening credit markets. As low growth and disruption continue, boards are focusing on mergers, acquisitions and alliances to create value. Innovation, new technology and changing customer demands are challenging businesses to reinvent their products and operations. At the same time, greater regulation is adding complexity to corporate strategy. Most companies, with an imperative to reorganize their portfolios, are responding with a mix of buying and partnering to underpin future success. Everything is changing for executives — except the expectations of their investors and stakeholders around higher growth and returns. Profitable growth is a mainstay demand of business. The list of what is changing includes unprecedented technological advances, the blurring of sector lines, uneven geographic growth, workforce dynamics and more geopolitical uncertainty. These changes are compelling companies to reinvent and rethink their strategy. This strategic reset is drawing executives to the deal table. While organic growth remains important, our latest Barometer finds a near-record 57% of companies actively pursuing acquisitions in the next 12 months, pointing to an M&A uptick in 2017. But this is a very different type of deal table. The menu of choices is broader — joint ventures (JVs), alliances, partnerships and industrial mash-ups are all options. And the availability of information and data is enabling earlier and richer assessment for transactions of all types. Regardless of the deal structure, what assets are executives looking to acquire? Creative disruption is now part of the fabric of business life. As a result, companies are actively searching for the innovation necessary to reshape growth. Smaller, smart deals are in pipelines as executives look at a variety of options rather than a plain-vanilla approach to their investment strategy. Startups and fast growth tech innovators are in the crosshairs. Of course, traditional deal challenges remain, but many others have emerged in this new environment. As sector convergence increases, the integration of assets outside a company’s traditional core is far from straightforward, requiring customer-centric, bespoke solutions. Additionally, the rise of nationalist politics adds a new layer of complexity to cross-border investment strategies and deal assessments. 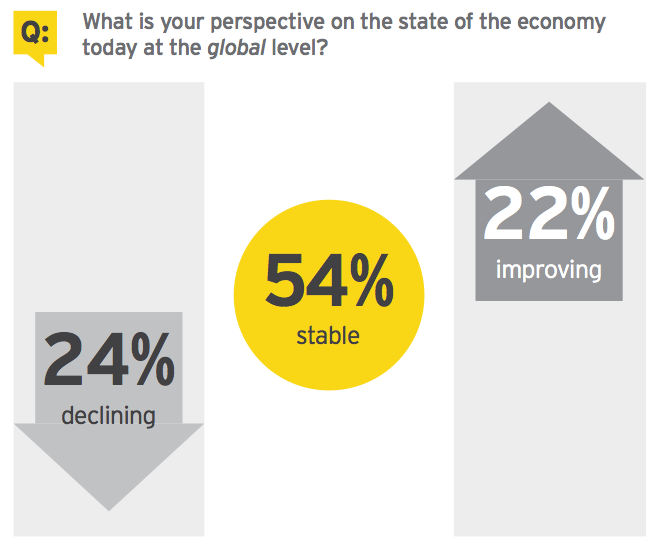 The majority of executives surveyed see the global economy as stable or positive — even as actual economic results across the world have been variable and sometimes contradictory. Companies are challenged by the ongoing uncertainty over where faster growth will come from. Add to this frustration the impact of events, such as the United Kingdom’s decision to leave the European Union (Brexit), the heightened market volatility caused by US interest rate uncertainty and upcoming elections in several countries. Our survey finds that these factors have precipitated a slight upturn in the number of executives who see the global economy as declining. The perceived fragility of the current market means overall macroeconomic sentiment is susceptible to any major systemic shock. This environment creates a backdrop where strategically-focused, growth-oriented inorganic moves are necessary to grow revenue and earnings, including M&A, JVs and alliances. Companies are using deals and alliances to improve their competitive positioning, extend product offerings or move into new markets or industries. Executives are moderately upbeat about the overall outlook for capital markets, despite 2016’s sporadic periods of market turmoil. 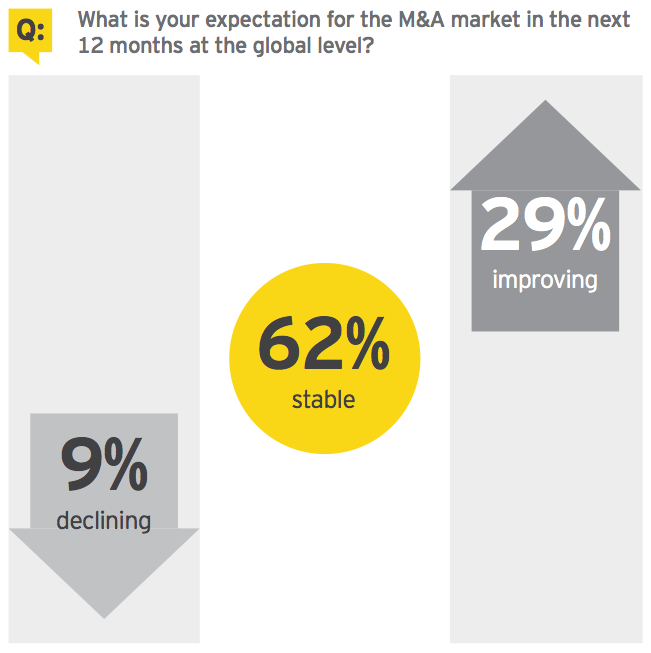 A majority of executives see conditions over the next 12 months as either stable or positive. In terms of corporate results, the past year has been marked by a downturn in company earnings. Executives’ slightly more positive outlook suggests this trend may be near an end. If an upturn is in the offing, it is unlikely to manifest across all sectors or geographies. Downward pressures persist in several industries and regions, particularly resource-based sectors and countries. The most notable response shows a declining sentiment in outlook for credit availability. This view may be influenced by concerns over tapering of quantitative easing policies, especially at the central banks in Europe and Japan. Such a shift may impact credit markets, especially for lower-rated segments of the economy and emerging markets. Having experienced almost a decade of macroeconomic uncertainty, executives have become accustomed to ambiguity about global economic growth, highly volatile capital markets and confusion about the effects of monetary policy on currencies. These heightened risks remain ever-present on the business landscape. However, in 2016, political uncertainty — both international and domestic — has been elevated as a risk to economic growth. Ongoing capital market uncertainty, including currencies and commodities, remains the predominant near-term risk for executives. Nearly one-third of respondents regard this as the most important risk to their business models in the next year. Without question, politics is now firmly back on the agenda for executives. The rise of populist parties across the globe has become a rising concern for executives. Nearly as many executives regard this as the most important risk to their business as cite capital market volatility. This political shift could begin to undermine confidence in existing cross-border supply chain and customer relationships. Companies are also contending with growing uncertainty about tax policy, doubts about the direction of trade policy and fears about the return of national protectionism. This year has also seen a ratcheting up of geopolitical risks, including terrorism and territorial disputes. Growing tensions in the South China Sea, greater international entanglement in the Middle East and the increase of terrorist incidents around the globe have added an extra layer of complexity onto the strategic plans of many global companies. Cross-border trade flows have also begun to slow significantly, with growth falling to its slowest rate since the global financial crisis. The cyclical downturn in aggregate demand from developed economies, the influence of economic rebalancing in China and the rise of protectionism all contributed to the slowdown. With political appetite for further trade deals waning, executives may come to regard this as a fundamental structural reform of the global economy. As China’s economy rebalances toward a consumption- and services-led model, executives are waiting to see how this affects growth. For now, continuing high levels of volatility in global capital markets and an overall increase in political instability around the world are more acute concerns of executives than China’s evolution. Similarly, executives see economic and political stability in the European Union (EU) as less of a pressing near-term risk. Given the list of challenges the eurozone has faced since the financial crisis, global executives have become more accustomed to navigating uncertainty in the EU. A perfect storm of accelerating innovation, sector convergence and changing customer behavior is disrupting business models. The rapid rise of new ways of doing business, predominantly through digital channels and with innovative ways of utilizing labor, is changing operating models. Companies are responding by reimagining their value proposition and reorganizing themselves to take advantage. At the same time, greater industry regulation is adding a layer of complexity to corporate strategy. As companies increasingly operate across geographies, they are having to comply with varying standards and levels of oversight from regulatory and competition authorities. Many companies now find themselves operating different models in different geographies, forming alliances with local partners or, in extreme cases, withdrawing from certain countries altogether. As ever, companies with a mindset that disruption is more an opportunity than a threat will be best positioned to compete and thrive. 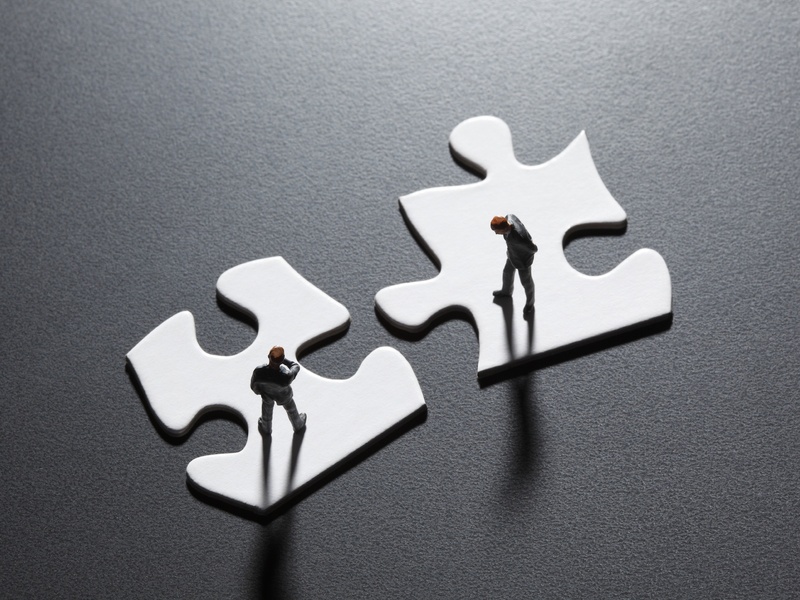 In such a fast-paced, ever-evolving environment, many executives are looking to mergers, acquisitions and divestitures as a means to thrive. These companies find that a well-tuned, resilient capital allocation structure must be built around transactions, including a proactive wish list of acquisition targets and a watch list for potential divestitures. 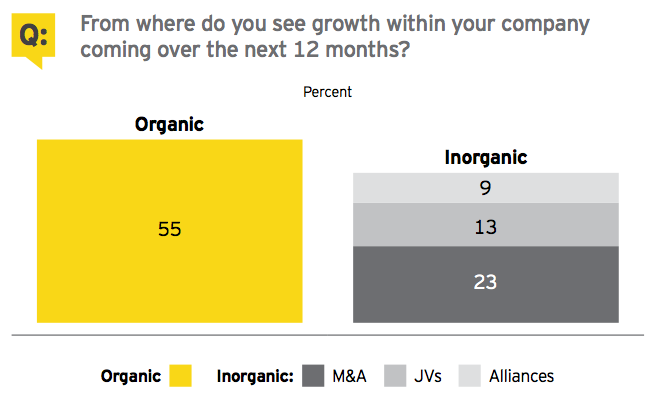 Amid this low-growth environment, many executives are taking a judicious view on where the sources of their growth will come from, balancing both organic and inorganic routes. Downward trends in productivity and profitability are compelling companies to redefine their core operations to accelerate profitable growth. This balanced organic and inorganic approach supports a positive outlook for dealmaking. In addition, executives are maintaining a healthy outlook for JVs and alliances. In many cases, such arrangements are the first road companies pursue. These alternative deal structures may be the fastest way to take advantage of rapid transformation in a sector or to access innovative business models or new ways of working. A more technology-driven environment is changing the skills required of workers. Companies are being compelled to bring their workforces up the curve in order to operate in this new environment. More than two-thirds of executives acknowledge that a transformation is underway in how people will work in the future. This skill shift will require new ways of thinking as humans move further toward managing robots. As machines become workers, this transformation will be unlike anything the labor markets have witnessed before, even in this era of disruption. Contrary to popular perception, executives believe technology and automation are likely to increase, not decrease, overall employment. More than half of executives expect this revolution in working practices to create roles, with only 19% ultimately expecting to reduce the number of employees. The next few waves of disruptive technology are poised to transform how people view work. Many people now work remotely or flexibly, or work for multiple companies instead of a sole employer. Jobs that remain truly untouched by this wave will be the exception rather than the norm. Automation will both replace and supplement human labor. The history of prior waves of changing work patterns shows that automation surprises us with new sectors and new forms of employment. Economists are struggling to understand why greater automation in the workplace has not translated into greater productivity at a national level. However, this may be about to change. Our survey finds the split between successful and unsuccessful investment in automation in near balance, with 37% of executives seeing an increase in productivity from automation versus 32% who have experienced no improvement. In the past, businesses may have been less aware of the opportunities of disruptive innovation. Companies often did not understand the constraints they faced in formulating their responses and did not execute well enough. In this automation wave, however, enterprises are learning how to capitalize on the opportunities. They are studying other organizations, including nontraditional entrants and different industries. A quarter of respondents say they are duplicating automated and non-automated processes until they are comfortable with the stability of the automation. This is especially so in the services sector, where automation is a relatively new concept. These companies are beginning to learn from their industrial counterparts the best routes for transitioning skills. Depending on the various disruptive forces affecting their businesses, many companies are proceeding one step at a time. They are strategically responding to outside catalysts and positioning themselves to respond to future technologies. More than half of executives surveyed plan to make acquisitions in the next 12 months. This is a clear signal of their determination to counter the low-growth, disruptive environment. Despite economic uncertainty, the appetite for dealmaking remains well above the Barometer’s long-term average. This points to an upturn in M&A in the first half of 2017. In 2016, we have not seen a return of the megadeal boom that characterized 2015’s M&A markets. However, investors have been broadly supportive of growth-oriented dealmaking this year. The average stock price movement of acquirers upon announcement has been positive, particularly where there is a strong growth narrative in place. Executives are also aware of the need to support valuations higher than the long-term average should the equity markets falter, as they did at the start of 2016. Executives’ positive dealmaking sentiment is further reflected in their continued expectation of stability or growth in overall M&A. Our survey finds 91% of respondents expect the deal markets to grow or hold steady over the next 12 months. While market analysts do not expect a return to the record-high total deal values of 2015, executives appear confident that a sustainable M&A market will persist. Companies with a standstill stance on M&A will fall behind on their strategic agenda. Larger deal pipelines support a forecast of an uptick in M&A activity. Executives report a big increase in the number of potential targets they are reviewing. Nearly half of respondents say they have five or more deals in their acquisition pipelines, continuing a strong upward trend over the past three Barometers. The desire to buy innovation, especially startups, which may be in different industries or geographies, is necessitating larger pipelines as companies screen more targets. Executives are looking for acquisitions that both augment their current strategy and offer the potential to supercharge future growth. The need to acquire smaller, more innovative assets is reflected in executives’ planned deal sizes over the next 12 months. So far, 2016 has brought a dropoff in megadeals, largely due to concerns over regulatory oversight, a trend that appears likely to continue. Accordingly, our survey reflects an increase in planned deals in the US$250m to US$1b range. Previously, these deals may have been considered bolt-ons. However, due to their positioning at the heart of companies’ growth strategies, they can now be considered “augmental” M&A, a status between the transformative-scale deals of 2014–15 and the smaller add-ons of 2013. Executives have become more comfortable with transacting in the past three years as more companies have returned to dealmaking. They know what will work and what will not, increasing the likelihood that deals complete. They are more prepared to take risks and sometimes to fail. The need to respond to challenges while navigating a complex and fast-changing environment makes dealmaking an imperative, not just for growth but also for survival. As well as being a driver of today’s deal marketplace, big data and analytics are being adapted as an enabler of a more robust and sophisticated deal process for companies. Transaction analytics uses data, technology and advanced quantitative analysis to drive more speed and precision than before. This enables better questions to be asked during the diligence process. As companies need to look at more targets, often in unfamiliar industries, deal teams are using data and analytical tools to identify areas of growth and related potential targets, aligned with their strategy. There is also a strong use in identifying synergies and valuations. Again, this is an area where unfamiliarity of targets and their industries makes deal success harder to achieve. The number one reason for reducing an offer price or walking away from a deal is a lack of confidence in information. Executives need to be able to draw the right insights from new data sets, harnessing the power of new technology and more statistical methods to model investments, deal scenarios and return on investment (ROI). Ultimately, transaction analytics helps provide better answers to complex capital agenda questions. Executives want to apply more sophisticated analytics in their buying and selling processes, yet there is a worldwide shortage of skills to provide business and industry-specific analysis to aid executive decision-making. As companies look at a broader range of targets — often in unfamiliar industries — deal teams are using transaction analytics to identify growth opportunities. Historically, securing synergies across operational functions and IT would have dominated the integration agenda. Today, preserving the customer and sales channels being acquired are strategic objectives on an equal footing with the traditional issues. This rebalancing of front- and back-office considerations will accelerate in future. In order to ensure full strategic value is maximized, identifying and accurately quantifying all types of synergies is critical. That is far from straightforward when integrating within an industry — cross-sector convergence through M&A adds a whole new layer of integration complexity. Executives are as concerned about mitigating potential loss of customers and sales as they are about discovering new customer and market opportunities through integration. This appreciation of the need to preserve — or enhance — the customer experience and deliver upside value rather than just cost benefits requires bespoke integration strategies. Executives also express dissatisfaction about a range of other post-deal issues. One of the more interesting results is an underappreciation of the amount of senior management time and resources required to successfully see a deal through to the end. Executives recognize the need for continued investment to grow newly acquired businesses but have underestimated what that takes to fully deliver. Challenges around integrating IT have been a mainstay of integration and will remain high on the agenda given the proliferation of cloud computing and shared services centers. Another growing consideration are the issues that arise when two different corporate cultures are brought together. As companies continue to buy or partner outside their core sector, culture will become an even bigger issue. This is particularly relevant when more traditional companies partner with innovative start-ups or tech companies — then, cultural “digi-gration” is a fundamental consideration. Executives should also be realistic about the potential negative synergies, including customers that may be unable to continue their relationships with the new entity. Negative synergies also result from losing focus during the transaction process. This can leave both the acquiring business and the target at risk from competition as management resources are redirected away from core operations and competitors actively target key personnel and the market. The success or failure of a transaction’s integration depends largely on the level of preparation, planning and readiness of key functions and stakeholders and their ability to deliver. Focusing on drivers of value early, especially a keen awareness of the customer experience, is now a requirement for success. A disciplined, realistic, value-led approach to transaction integration that is unique to each deal will increase the potential for avoiding costly mistakes and deliver on the strategic objectives of the deal. Sector blurring — companies making increasing and deeper incursions into adjacent or unrelated industries — has become a prominent feature of the current M&A market. Executives looking for deals outside their own industries show determination to reimagine their market. Companies’ most cited factor for cross-sector acquisition is, unsurprisingly, reacting to competition, followed by a desire to acquire new products or services. In both cases, these are being driven by new market entrants upsetting the status quo, changing the competitive landscape with new operating models, new ways of creating demand, as well as hybridization of products and services. Cross-sector deals are also being prompted by the changing expectations of customers and the need to engage more proactively with potential customers, especially via big data and analytics. An associated strategic driver is the need to acquire talent from other industries — an acknowledgement that sector blurring is a two-way process. As companies move outside their existing core operational areas, they see a need to onboard expertise to guide them through unfamiliar territory. In many cases, this means acquiring smaller companies, and even rivals, where this knowledge can most easily be identified. Of course, companies continue to actively pursue deals in their core sectors, with a primary focus on traditional market share growth. They are also looking to acquire new technology and production capabilities to improve efficiency and margins. Executives also say they are reacting to changing customer behavior when considering such deals. In an ongoing low-growth environment with margins and profitability challenged, companies are looking to broaden their offerings and become the single vendor of choice, especially in markets where they have a strong position. For those companies prepared to make bold acquisitions in an uncertain environment, the combination of a strong product offering and global reach are the likeliest routes to increased market share and growth. Percentage reflects those who intend to actively pursue acquisitions in the next 12 months. Many large consumer goods companies are being challenged by disruption. Digital technologies from machine learning and artificial intelligence to cloud computing are transforming everything from supply chains to data storage. Additionally, direct-to-consumer brands are challenging traditional retail strategies and the relevance of physical stores. Many companies are faced with a rising tide of smaller, nimbler, digital-first competitors. Recognizing the need to accelerate innovation, many businesses are building venture capital arms to buy smaller, more agile companies. They are focused on granular consumer segments that offer new, more relevant levels of benefit. C-suite executives are embracing change and will be prepared to experiment in the short term to achieve increased profitability. Global industrial activity in the first half of 2016 increased slightly. Growth in the US and Japan has been modest, while the eurozone shows resilience amid uncertainties. Global trade momentum is expected to continue to trail global GDP growth. However, increased activity from key exporters in Asia may boost future manufacturing results. Executives are recognizing the importance of preserving a long-term competitive edge to increase profitability and retain market share. Innovative technology is transforming existing product lines and supporting the rollout of new products and services. Many industrial companies are looking to acquire these transformative technologies rather than develop them internally. This growth strategy could spur increased deal activity, especially for targets with highly specialized assets. Due to rising payer and provider power — and increasing focus on linking drug and device prices to patient outcomes — companies believe they must achieve leading positions in fewer therapeutic areas to compete commercially and reignite growth. These core growth challenges will continue to drive the industry’s M&A and divestiture agenda. While substantial revenue growth remains elusive for many, life sciences innovation has never been stronger. With maturity comes challenges: Like many pharmas, some commercial-stage biotechs are facing an uphill battle for growth. They risk disruption from smaller biotechs with cutting-edge therapies and technology players that see opportunities in managing the flow of health data. This disruption is expected to create deal activity within the sector and across other industries. It appears that neither equity market volatility nor geopolitical uncertainty can halt global tech M&A. Even activist investors’ scrutiny seems no barrier to continued growth — and activists may actually be fueling activity. Tech companies will continue turning to M&A to accelerate their transformations and to build end-to-end solutions. Non-tech companies will increasingly acquire tech, driving up cross-industry blur — and all will pursue security technologies. M&A continues to be the primary choice to help corporate strategy keep pace with unprecedented disruption from rapidly advancing digital technologies. Digital disruption and the blurring of sector lines have automotive companies planning for multiple possible futures. Until just a few years ago, automakers were at the center of an industry that was concentrated on affiliated functions such as financing, parts supply, logistics and retail dealerships. Now, the ecosystem has grown to include many new stakeholders: cities, ridesharing operators, government agencies, technology and telecom providers, media and entertainment companies, transit service providers, energy companies and utilities, financiers, entrepreneurs and — most crucially — consumers. For auto companies, M&A plays a critical role as an important, transformative option for expanding on the core products and services of today — and accelerating the emerging businesses of tomorrow. Companies are grappling with the financial reality of excess debt and squeezed profits due to lower oil and gas prices, leading to a rapid transformation of the sector. This environment is also providing opportunities for astute investors, including private equity firms striving to uncover the silver lining of a depressed commodity price environment. Investors waiting to see if the downturn has definitely hit bottom are more likely to start doing deals in early 2017. In part, this is because the valuation gap has also persisted. Many potential buyers expect bargains at a time when sellers are loath to part with quality assets at low prices. At the same time, buyers and sellers have very different views about the future of commodity prices. This, in turn, may foster more innovative deal structures as firms test the waters with JVs or strategic partnerships or become more creative with hybrid equity-type investments. Cross-border dealmaking is still attractive, despite the rise in economic nationalism, protectionist measures and a slowdown in global trade. 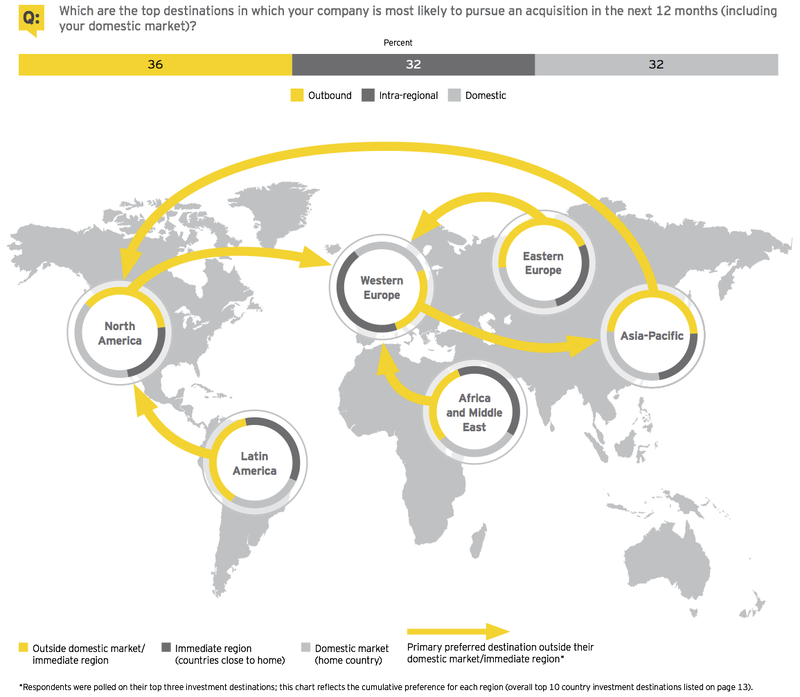 Our survey shows companies planning to look all across the map for their preferred investments. Companies are expanding geographic reach at an even faster pace in order to follow their customers, exploit strengths across high-growth markets and acquire talent and intellectual property. While geopolitical and regulatory landscapes are more complex, management teams have the experience, data and planning models to mitigate risk and complete cross-border M&A. These deals for geographic expansion are a strategic necessity. Geopolitical risk is an impediment to achieving strategic objectives, not a barrier. Amid unprecedented change, many companies have to reinvent themselves fast — organically and through inorganic investments. Beyond traditional M&A, JVs, alliances, partnerships and industrial mash-ups are emerging as alternatives to effectively secure deal value. Political uncertainty is increasingly affecting global trade and credit markets. Executives who do not proactively consider or effectively respond in their approach to dealmaking run the risk of poorly executed growth strategies. Complexity around the deal table can be simplified through the use of transaction analytics. Companies are looking at an increasing number of targets, often in unfamiliar industries. With multiple stakeholder considerations, accessing the skills needed to answer complex capital strategy questions is an imperative. Realizing full transaction value has historically been difficult to achieve. With the pace of dealmaking intensifying, and front-end customer experiences now as much a strategic consideration as back-end cost synergies, integrating assets is more complex than ever. A disciplined C-suite-sponsored integration strategy unique to the deal scenario is crucial. The rapid rise of new ways of doing business, predominantly through digital channels and unique ways of utilizing labor, is fueling dealmaking aimed at securing innovation. Companies who adapt their strategies and operating models, to not only protect but also take advantage of technology and innovative thinking, will be best placed to seize competitive advantage. • In August and September, we surveyed a panel of more than 1,700 executives in 45 countries; nearly 50% were CEOs, CFOs and other C-level executives. 419 executives were surveyed from the US. • Surveyed companies’ annual global revenues were as follows: less than US$500m (18%); US$500m — US$999.9m (24%); US$1b — US$2.9b (17%); US$3b— US$4.9b (17%); and greater than US$5b (24%). • Global company ownership was as follows: publicly listed (66%), privately owned (30%), family-owned (2%) and government/state-owned (2%).